I’ve written about luxury tiny homes made on Vancouver Island recently and wanted to see who else was in this space in Canada. I stumbled upon these incredible loft luxury tiny homes by the Mint Tiny House Company out of beautiful Vancouver, BC, Canada. They have more than a few styles and sizes they build but their loft edition is what caught my eye straight away. I’d personally want the largest tiny home possible, and Mint will go up to 36ft while still staying registered as a RV. While it might not be the ultimate survival retreat, it makes use of its space to not only be comfortable, but look damn good. As you can see from the interior pictures so far, they really can do amazing things with the interiors of these tiny homes. From some angles you would be hard pressed to tell if what you were looking at was inside a tiny home. Mint offers builds as small as 24ft, and now you can get a metal frame which drastically reduces the weight of the overall home. However, in here space is not wasted making way for the possibility for a fantastic kitchen arrangement. Some of the options include butcher block veneer countertops, Moen sink faucet, tracked lighting, stainless steel sink and a lot more. You can choose your own appliances to complete the tiny kitchen of your dreams. Bathroom setups can be quite spectacular as well giving you almost all the comforts you’re used to. As you can see in the above picture, a washer and dryer can be squeezed in here as well which is a really nice touch. 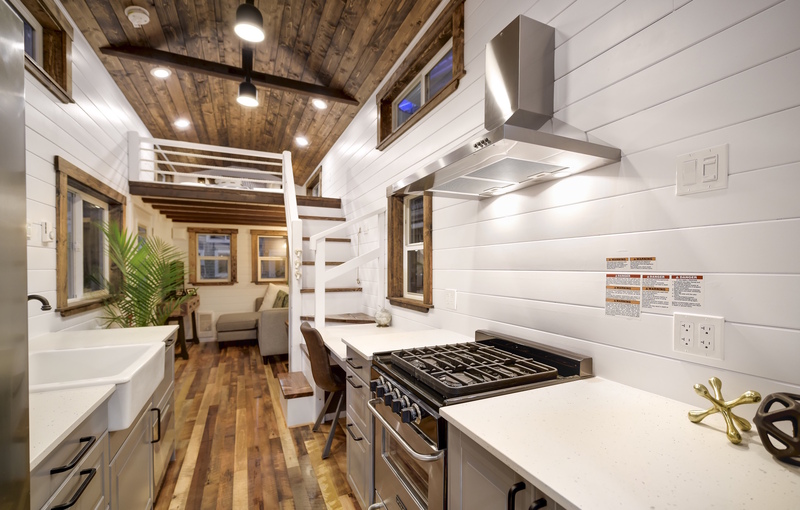 Take a look at the rest of the Mint Luxury Tiny Home Lofts they’ve built in the past. If you would like to seem of their work check out their website or give them a call via 778 434 2698 to learn more.